If you're looking for that ideal pressent for someone with rabbits, guinea pigs, chinchialls or other small animal, then look no further! 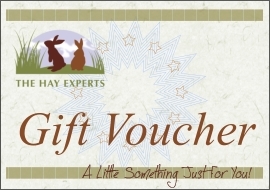 The Hay Experts Gift Voucher is a great present. Simply visit the Gift Voucher product page and select the value you'd like the voucher to be. The Gift Voucher comes with a free blank card so you can write a message to the recipient - and if you would like us to send the card directly to the recipient, we will happily write your message for you - just add the message in the gift message box during checkout and we'll do the rest! Each Gift Voucher can be supplied to the value of your choice and is quick and simple for the recipient to redeem - they type in the provided code from the voucher during checkout and the value of the voucher is deducted from their order total. Simple! In addition to the free card, we are supplying our Gift Vouchers with free delivery too! You don't need to worry about any extra costs or finding a stamp to send the voucher onto the recipient, as we can send it direct to them on your behalf. The Hay Experts Gift Voucher really is the perfect choice; great to give and just lovely to receive! To find out more visit the Gift Voucher product page for further details. If you've received a Hay Experts gift voucher, redeeming it during shopping with us is easy. Simply add items you'd like to buy to your cart, and when you are ready press checkout, and you will be taken to the shopping cart page. Enter your voucher code in the box on the right (labelled Gift Voucher Codes) and press Apply Coupon. The value of the voucher is automatically deducted from the value of your cart. Then proceed with the checkout as normal. If you change your mind and decide to use the voucher on another occasion, simply press Cancel Coupon and the Gift Voucher will be removed from your order total. Just don't forget to keep the Gift Voucher in a safe place for when you do wish to use it!